In 1989/90 United had just come up from the Third Division with Dave Bassett in charge, and with the brilliant pairing of Brian Deane and Tony Agana up front they stormed through the division, outshining established clubs such as Newcastle, Sunderland and West Ham. A 4-0 defeat at Elland Road on Easter Monday seemed to have ended United’s chances but they responded by going undefeated for the rest of the season, including that memorable 5-2 win at Leicester on the last day. Newcastle, two points behind before the final match, surprisingly lost 4-1 at Middlesbrough, but Leeds’ win at Bournemouth meant they won the title from the Blades on goal difference. Then in 2005/06 United managed to keep Leeds at arm’s length as we chased Reading, but three defeats in March allowed Leeds to almost bridge the gap. But as soon as it got close Leeds fell apart, going six without a win. 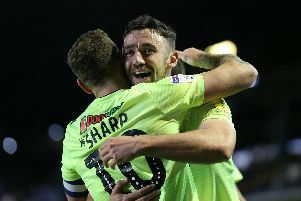 United recovered their form and with a big goal difference advantage promotion was virtually assured with four still to play when Danny Webber got the Good Friday winner in a 1-0 triumph at Cardiff City. Leeds’ draw at home to Reading the next day made it certain and I still remember the joint party in the Cherry Street car park as several Reading fans stopped off on their way home to join in the celebrations. What will happen this year is anybody’s guess as the clubs see-saw in second and third. Even if Leeds come out on top United have had a magnificent three seasons under Chris Wilder, who has put a big smile back on everybody’s faces.